In Kitchen Confidential, author and professional chef Anthony Bourdain gives a no-holes-barred account of life behind the stoves. Filled with wry observations, fragrant characters, self-depreciating humor and peppered in spicy language, Bourdain takes readers from his culinary awakening in France over twenty five years ago, to the kitchens of Provincetown and Manhattan, with plenty of “steamy hot” cuisine along the way. 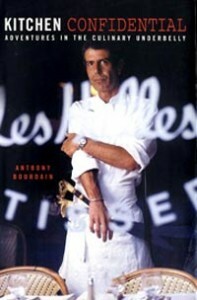 Bourdain’s tell-all of the restaurant trade should be required reading for those entering the culinary profession. And, for those diners in search of the real restaurant experience, consider yourself warned. Kitchen Confidential is crackingly funny, informative, and all in all a ripping good read. Witty and fun to read. Cheers, Michelle.